In Memoriam: The 9-to-5 Workday. May It Rest in Peace. Among the many losses of 2016, the perfunctory 9-to-5 workday bid its final farewell after an oft reported, slow death. Born of the Industrial and Intellectual ages, the 9-to-5 was a bygone reminder of simpler times. It prompted nightmare commutes, infinite mind-numbing meetings and gave us the two-day weekend, TGIF and the dread Monday. What was meant to drive productivity and structure work-life balance, instead the 9-to-5 mushroomed into a ravenous, beast always hungry for more time to get less done. The 9-to-5 spawned generations of latchkey kids, of missed family and friend events, of never having time for the gym, for cooking real food or many of life’s other luxuries like sleep. 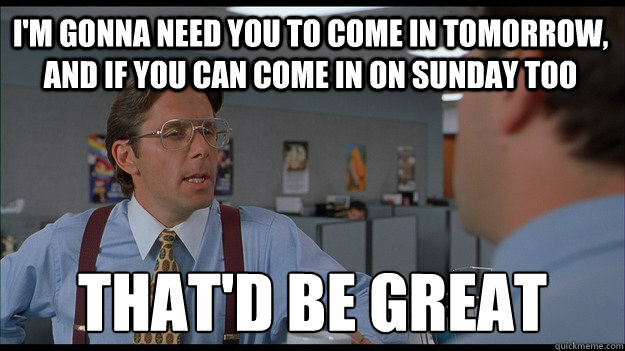 Surprised I haven’t used more Office Space memes. Leaving behind more productive flexible schedules, a growing shared economy, a catchy Dolly Parton hit and still scarily spot-on movie, the 9-to-5 workday will not be missed. Blame it on the Internet, and email. Blame computers, laptops and tablets. Blame The Cloud. We’re no longer tethered to wires, desks. We’re not trapped by geography and grey cube farms. It’s a mad, mad 24/7, social media never sleeps world. Work happens all day, everyday. We can – we do – work anytime, anywhere. It is well past time for Management and Human Resources to rethink the ‘traditional’ workday, bid adieu to the 9-to-5, its second cousin the 8-to-6 and while we’re at it, its grouchy uncle who drinks all your good booze, the Monday-Friday workweek. See only about a gazillion studies on productivity and efficiency, on creativity, on employee retention and recruitment, on time management, all that make a business successful. Hell, just watch Office Space. It’s 2017. It makes no sense to limit your company’s most essential resources – your employees – to an outmoded, outdated, DOA work schedule. The best schedule for anyone is when they do their best work that works best for your company. What schedule ‘works‘ for you? Twitter tastes like crow? So I was wrong. What happened to the News? We did. Subscribe. Get email. You know how this works. Ruh roh! Something went wrong. I take privacy seriously. No spam or junk mail, promise.